In the fourth episode of Harry's Last Stand. Harry Leslie Smith talks about the UK General Election, the dangers of nuclear war, the suffering caused by Tory austerity. 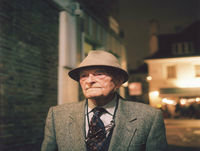 Harry Leslie Smith also reflects on how spring always makes him remember the last days of the Second World War, when he along with an RAF unit crossed into a dying Nazi Germany.